Sandro Botticelli’s Birth of Venus is of course one of the most iconic artworks of the Uffizi Gallery, and one of the most famous paintings all over the world. There are several stories concerning this painting, and some of them are between history and legend: they take place in the Florence of the Medici family, during the 15th century. The model painted as Venus is Simonetta Cattaneo Vespucci. She was a noblewoman from Genoa or perhaps, as many people like to believe in – to underline the names coincidence – from Porto Venere (Venus Harbour). Simonetta arrived in Florence together with her young husband – a distant cousin of Amerigo Vespucci – just in the period in which Lorenzo the Magnificent and his brother Giuliano, of the Medici family rose to the power. The couple joined the court life, and Simonetta’s beauty became legendary in Florence. It seems that Giuliano and Botticelli himself fell in love with her. In 1475, “the Giuliano’s tournament” took place in Santa Croce square. It seems that Giuliano participated in it because the prize was a flag with the portrait of Simonetta – painted by Botticelli. La Sans Par, “the unequaled” was written on the flag. 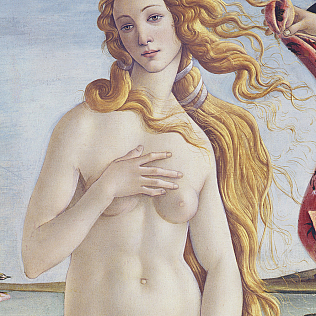 Simonetta did not inspire only the Botticelli’s Venus, but even other women painted by the artist. He obtained to be buried at the foot of his muse, in the Florentine church of Ognissanti. However, Botticelli was not the only one to be inspired by the young blond woman: Piero di Cosimo portrayed her as Cleopatra and Lorenzo the Magnificent and Luigi Pulci wrote rhymes for her. The young woman was a presence as much stunning as short-lived in Florence. She died just a year after the tournament of which she had been the queen, probably because of tuberculosis. Even if she was dead, Botticelli kept on realizing his artworks inspired by her. Botticelli’s Venus and Spring – his masterpieces at the Uffizi Gallery – were painted about ten years after the girl’s death, but her beauty was well-fixed in the artist’s mind, who painted her by memory.